If May was our month to tiptoe outside again, June is our full-on garden party. The time to plan something fun to do in the sunshine each and every weekend. After all June is, by presidential proclamation, National Great Outdoors Month. So, in the spirit of compliance with that executive decree, here is a month’s worth of events to tempt you beyond your freshly greened-up, BackCountry™ backyard—as beautiful as it no doubt is. Plus we threw in a few gatherings happening at our very own Sundial House and outdoor amphitheater, too. Huzzah! It’s time once again for all good lords and ladies to immerse themselves in the sights, sounds, and tastes of 16th century England. And yes, there will be turkey legs. 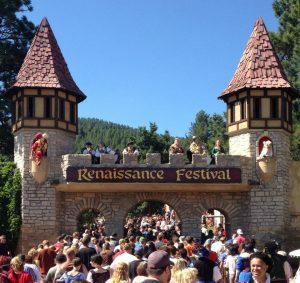 Entering its 40th season, the Colorado Renaissance Festival offers eight weekends of interactive revelry with costumed royalty and peasantry, jousters, jugglers, artisans, and minstrels. Enjoy hearty fare and multiple stages of performance. Held at Perry Park in Larkspur. Adult tickets $20.50; children $9. Learn more. It’s pretty cool that a city of Denver’s size has such a vibrant Asian community. You’d be remiss not to celebrate all things Japanese at the annual Cherry Blossom Festival. Their long list of events includes traditional Shigin singing and poetry chanting, dance, Taiko drumming, bonsai demonstrations, beer gardens, and a lively Saturday night performance by the Cheapsuits with special guest Danny Yamamoto. And the food, of course, will be worth the trip, including favorites such as sushi, somen, panko dogs, and teriyaki chicken. Held downtown at Lawrence and 20th and inside the Tri-State Denver Buddhist Temple. Learn more. At last. It’s time to make use of all that useless information floating around in your head. Back by popular demand, this evening of adult beverages and friendly competition allows neighbors to show off their trivia prowess. Geeks Who Drink is a Colorado-based company that hosts these highly entertaining bar trivia events throughout the nation. Gather up a team of friends and neighbors, bring your thinking caps, and savor the challenge—plus snacks, of course. RSVP through ActiveNet by Friday, June 17. Participants must be 21+. Email Christa Dellabovi at cdellebovi@ccmcnet.com with questions. Our metro area is home to many talented musicians. 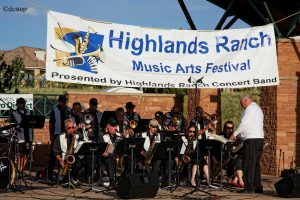 And many of them will be coming to play at Civic Green Park in Highlands Ranch. Lucky us. Bring your lawn chairs for two days of performances in blues, jazz, country, and more. Bring your cooler, too, or make it easy on yourself and enjoy food and drink—as well as arts and crafts—supplied by local vendors. No dogs, please. Learn more.